Almost anyone who has grown up in a Christianized culture can provide a basic understanding of the concept of sin. Sin is when you do something wrong to someone else or to God. Those with more advanced understanding may even include when you don't do something that you should have done - the vaunted sin of omission. Sin is usually described in terms of the one committing the sin. This is especially true in Churches whose complete communication of the Gospel is focused on what Jesus has done for you. It is hyper-individualistic at best, egotistic at worst. "Our expressions of worship and our religious practices focus on individual experience and choice. Personal freedom and the primacy of the individual rule our understanding of how society functions. But a hyperindividualistic ethos results in a disengagement with the reality of corporate sin. Social injustice is dismissed to focus solely on individual expressions of sin. This process relegates the role of the church exclusively to a hyperindividualistic expression. Sin has been reduced to an individual level." This hyper-individualistic approach has left us with an underdeveloped concept of sin that forgets the side of those who suffer when we sin. If a sin is committed it is committed against someone - God, your neighbor, even yourself. We forget the han. We turn to Andrew Park to help us understand the concepts of sin and han. He says that sin is “the wrongdoing of people toward God and their neighbors. Han is the pain experienced by the victimized neighbors. Sin is the unjust act of the oppressors; han the passive experience of their victims." Han is what the victims feel when they are victimized. But before we simply pass over this description, let us also consider the words of Young-Hak Hyun as he describes han as “a sense of unresolved resentment against injustice suffered, . . . a feeling of acute pain of sorrow in one’s guts and bowels.” Han is the wordless groan described by Paul. Han is the feeling that is better captured in art than in text. It is the shattered psyche in the broken places that no one wants to talk about. Han is the only word that can attempt to describe the feelings of violation felt by the raped woman — and yet it is still woefully inadequate. We can never fully grasp a Biblical view of sin unless we also grasp the concept of han. Preachers who teach the individual responsibility of sin without the effects of that sin on others misses the mark on good hamartiology. If only we had an archetype to help us grasp the concepts of han and the hyper-individualistic concept of sin. Something or someone who lived only for himself, committed grievous sins, was constantly running into problems with his reputation, but also had the ability to connect with the plight of others. If this person or archetype existed, what would we call him? What would be an appropriate name? Luckily for us, the hard work on naming a such a grand character has already been done for us. I'm not sure George Lucas had these two concepts in mind when penning the character of Han Solo, but I certainly can't find a better embodiment of sin and han than the appropriately named Han Solo. In Episode VII of the Star Wars saga, Han Solo and Leia allude to a pain they don't want to speak of — or can't speak of. There is a pain that has altered his reality and struck the core of his identity. He felt the pain of someone else's sin. Most of us can relate to feeling like victims of someone else's sin. We have all been lied to, after all. But Han Solo also embodies an ability to empathize with the plight of others. He can recognize that the Rebellion is the victims of the oppressive Empire and he eventually joins the cause — even if his connection is loose at best*. Han, the concept rather than the character, is not just about feeling victimized, it is about being able to empathize and recognize the result of social injustices upon those who are victimized not only by other individuals (domestic assault) but also by collective corporate empires of power that oppress the powerless. It is evident that by Jesus' harsh words in Matthew 25, that man should be just as concerned with their relationship with the oppressed and downtrodden as they are with their relationship with him. Those only concerned with their standing before God were cast into the outer darkness. We have this desire, innate or learned I am not yet sure, to align ourselves with power. Of course, if the God of the universe was hungry or thirsty it would be advantageous to get him a burger and a Coke. At the very least we have earned some grace and perhaps even a promotion in the kingdom that comes. But when Jesus was embodied by the oppressed of society the "righteous," as Jesus called them, could not identify, nor identify with their Lord. This sin was the absence of being able to recognize the han in others and it cost the "righteous" their place in the kingdom. Jehovah God has always been the God of the oppressed. He made legal mandates to punish those who raped women, to purposefully leave food for scavengers, and to welcome foreigners into their land as equals. I suppose that because the church has stood against abortion they feel they have obtained a pass to see the person of Jesus in the raped, the hungry, and the oppressed refugee. They have forgotten han. They missed the mark. They missed Christ. These references were all discovered in Soong-Chan Ra's book Prophetic Lament: A Call for Justice in Troubled Times which can be purchased from Amazon. Rah, Soong-Chan. 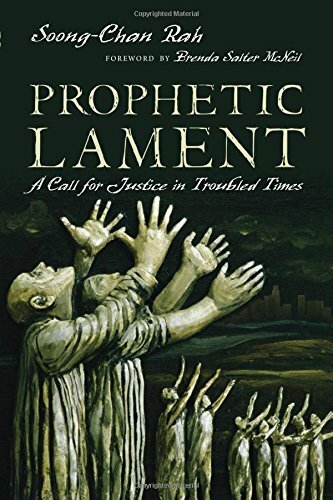 Prophetic Lament: A Call for Justice in Troubled Times (Kindle Locations 1637-1641). InterVarsity Press. Kindle Edition. 12Andrew Sung Park, “Theology of Pain (the Abyss of Pain),” in Quarterly Review, Spring 1989, p. 48. *At this point I want to offer an apology to any die hard Star Wars fans for any accidental omissions of misreadings. Admittedly, I am going on the recollections of watching the movies as a child, though I feel very strongly that Han Solo can teach us about the concepts of sin and han. ** I am aware of the safety concerns presented by allowing anyone into the country. Of course, it is dangerous, but no one said that following Jesus would be safe. This discussion is also rife with those who claim that God gives wisdom in these situations. It should be noted that God will not give a different "wisdom" then contradicts his already given word of God. If you want to keep foreigners out of the country for safety concerns, that is fine. Just stop claiming that this is what God wants. His own words prove that incorrect.